The Oxymax-CLAMS is available complete within an environmental enclosure, enabling researchers the ability to control temperature and day/night cycles. 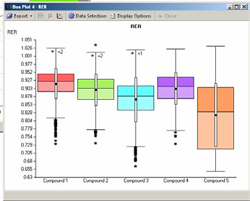 The Oxymax-CLAMS also has a dedicated operating and statistical analysis software packages. The Oxymax-CLAMS is the premiere system of its kind. 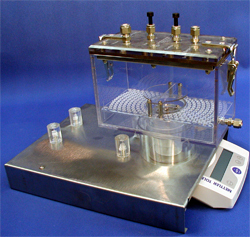 Incorporating sub-systems for open circuit calorimetry, activity, body mass, feeding, drinking, food access control, running wheel, urine collection, sleep detection, body core temperature and heart rate in an optional environmental chamber: Oxymax-CLAMS is the one-test solution for simultaneous multi parameter assessment of 1 to 32 test animals. Oxymax-CLAMS is constructed on a semi-custom basis incorporating parameters and features specific to your research. Any system can be expanded by way of more chambers and/or features at any time. Operation of Oxymax-CLAMS and data collection is performed by an integrated program. The resulting secure data sets can be exported to Comma Separated Value (CSV) files and provide the link between Oxymax-CLAMS and your existing data analysis tools. Additional data reduction tools allow for the de-collating of data by parameter to facilitate analysis from a parameter perspective. All data can be reviewed graphically & numerically in real-time during collection. 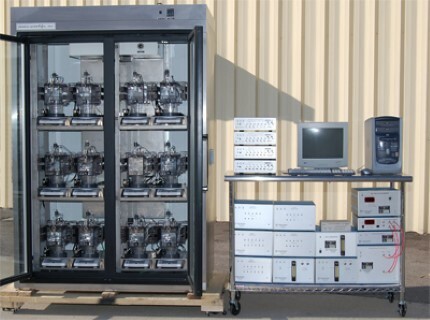 Oxymax-CLAMS provides fully automated operation for experiments lasting up to three days. Food and water may be replenished during experiment execution without the need for system restart. 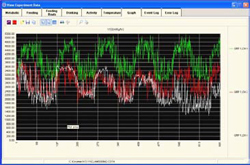 The Oxymax-CLAMS Software controls all subsystems and integrates the data into CSV format for easy evaluation and real time presentation. The primary data file separates each measure into epochs defined by the response time of Calorimetric readings. Activity and Feeding have secondary data files with higher resolution. The secondary activity file allows higher temporal resolution with shorter bin times; user selectable, typically between 10-30 second intervals. The secondary Feeding file is event driven, and records the time and mass of each feeding bout. CLAX Statistical Software – Oxymax-CLAMS can generate copious amounts of data. The CLAMS data eXamination Tool (CLAX) assists in the analysis of this data by presenting it in a meaningful fashion. CLAX allows for organizing animals within an experiment into treatment groups and provides tools for data trimming to remove information collected during animal acclimation. Data samples can also be sub-grouped into data collected during light or dark periods. The resulting trimmed and re-organized data may then be subjected to further analysis by CLAX.